This is a one-semester, three-credit course that consists of reading, research, and assignments completed in one-on-one consultation with a Director. Students may register for this course only after their thesis topic is approved by the thesis coordinator. This is a one-semester, three-credit course that consists of reading, research, and assignments completed in one-on-one consultation with a Director. Important: Students may register for this course only after their thesis topic is approved by the thesis coordinator. See the Important Dates section of our Application page for thesis application deadlines. 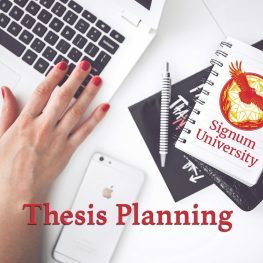 Students will hone their thesis topic, develop an extensive reading list, write four secondary sources reports, produce a sizable annotated bibliography, and write a prospectus for the proposed Master’s Thesis. Throughout the process, students will apply theoretical rigor and critical analysis to their readings and research in order to develop an original thesis argument. This course is a chance for the student to take all of the knowledge and skills he or she has learned during the previous Signum M.A. courses and apply them to a focused, long-term research project. The following assignments will be produced during the Thesis Research semester in close consultation with the student’s Thesis Director. Any or all of these assignments may be revised at the Director’s instructions and will be graded by the Director on a Pass/Fail/Honors basis. Students will develop an extensive reading list of primary texts, secondary studies (including book-length works, essays in collections, and articles in journals), and other related writings germane to the research project. This will be created within the first two weeks of the semester, as the student’s goal is to read all or most of the works on the list during the term. Perhaps 20 primary sources (including poems, short stories, screenplays, novels, autobiographical material, etc. ), 10 book-length secondary studies, and 10 scholarly articles/chapters might be a good basic formula for the number of works included. In consultation with their Director, students will identify which four of the book-length secondary studies are most important to the topic of the thesis. Other works may be substituted at the Director’s discretion instead of scholarly monographs, depending on the topic. The student will write a 3- to 5-page literature review on each of these four works (due at three-week intervals), surveying the content, quality, and relevance of the book to the topic of the thesis. In the last two weeks of the course, students will produce an extensive annotated bibliography of works relevant to the topic of their thesis. The citations will conform to the approved style. Following each citation, there will be a paragraph or more describing the student’s interaction with and assessment of these texts. This paragraph will state how much of the work the student read, evaluate the work’s quality, offer a discussion of its relevance to the thesis topic, and assess its place in current scholarship, etc. 20 primary sources – including poems, short stories, screenplays, novels, autobiographical material, etc. Some topics will lend themselves to reading more heavily in primary sources or in scholarly assessments; some texts have been studied very little and will require creativity in the compilation of a reading list. Students and Directors should consider including theoretical works not directly relevant to the topic to establish a methodology or as models of the application of academic approaches to other texts. In the last two weeks of the course, students will produce a prospectus that is essentially a significant revision and expansion of the Thesis Application. This 3 – 5 page document describes what student wants to say in the thesis and why. Of course, each of these items is subject to change as students write and revise their thesis.